It had been a very busy safari day, wheeling around the great, green expanse of Nkuru National Park perhaps the best place in all of Africa to spot rhino. I stopped counting after 25, spotting both black and white, in little clusters as well as lone animals cutting a rugged, solitary figure out on the vast plains. But rhinos weren’t the only attraction in the park. Driving down a road with the savannah on one side, the park’s namesake lake on the other, I’d seen zebra, gazelle, a big flock of vibrant, pink flamingos, and even a family of hyenas, the playful young ones daring each other to get closer to our safari vehicle. Our group had also parked to take in the sweeping views of the Great Rift Valley, looking out over the blue Nkuru to the ridgeline far beyond, the mischievous baboons of the park taking advantage of our absence to climb all over the vehicle in search of food. But perhaps the biggest thrill came that night. Having eaten our dinner al fresco, the group sat by the campfire long into the evening, recounting the events of the day. Rising and ready to head to bed, we turned around, shining the beams of our flashlights to ensure that our fire had not attracted any big cats or rhinos. 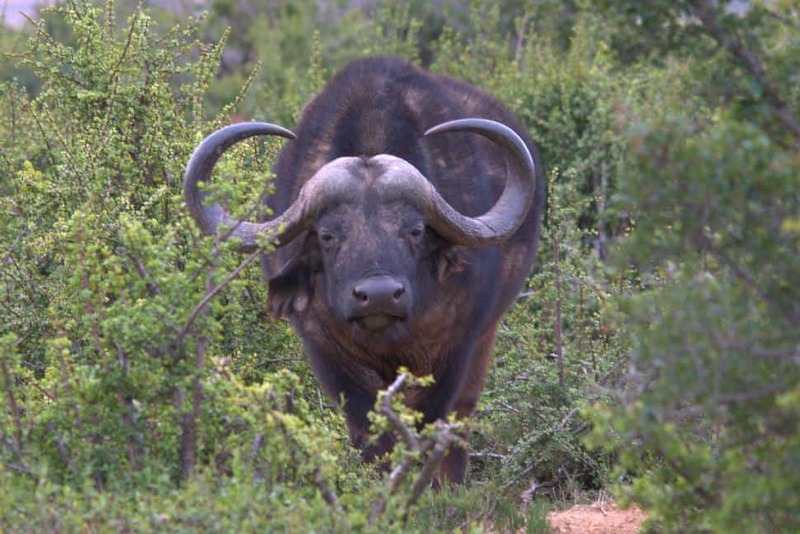 Instead, it was instantly revealed that a giant Cape Buffalo stood just a few paces beyond the spot where we had sat for hours. Huge, powerful animals, these buffalo are one of the famed Big Five, strong enough to tip over even large trucks, should they take a notion. There was an awkward moment – we wavering, not sure exactly what to do, and he slowly, warily staring back at us, doing the same. And then the big animal turned and trotted off, back into the shadows. Our group let out a collective sigh of relief and, our day of adventure now truly over, headed off to our warm beds. I was in Kenya, one of Africa’s most popular safari destinations, and a place that truly brings together all the best that this part of the continent has to offer. With abundant wildlife, excellent safari lodges, beautiful scenery and ample services, a trip here is a comprehensive African experience, and a great choice, especially for first-time visitors to this part of the world. Fairmont Hotels & ResortsI started my Kenyan adventure at the fabulous Fairmont Norfolk Hotel in Nairobi, the country’s capital. 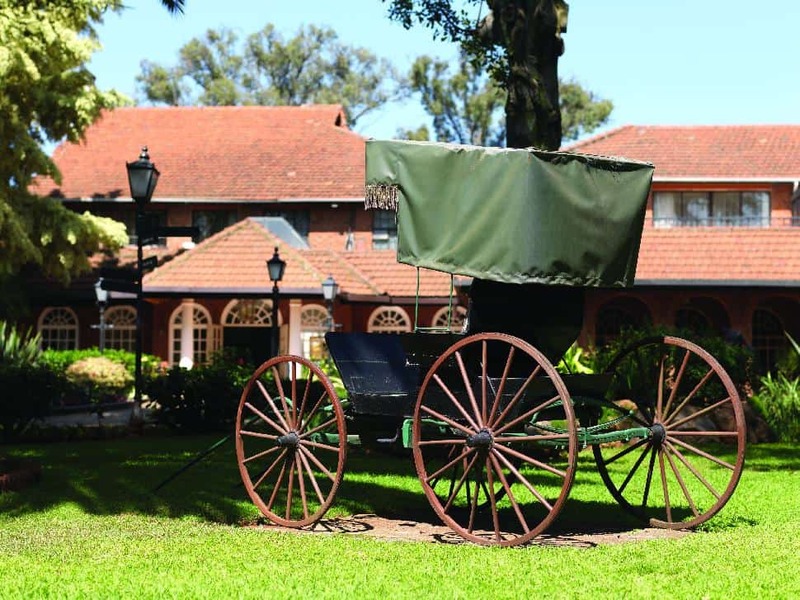 Built way back in 1904, a stay here is a luxurious throwback to the colonial days when illustrious visitors would arrive by train and be ferried to the hotel in rickshaws. Many of these remain around the verdant grounds, which bloom with all sorts of native flora, from broad fan palms to iconic acacia trees. You could easily lose yourself in a reverie, imagining yourself here during those days – corridors feature black-and-white photos of famous figures like Finch Hatton and Karen Blixon, while each wing of the hotel – built in different eras as the place expanded over time – has its own historical charms. The Norfolk is also a great place to launch a walking tour of Nairobi; the city’s markets and central business district, as well as the national museum, are all just a short stroll away. Feeling refreshed and ready to go, I was ready for more adventure, heading to another of Kenya’s great wildlife reserves, Aberdere National Park. There, sister lodges The Ark and Aberdere Country Club provide very different experiences. At the former, you can expect a number of exotic, four-legged visitors. The lodge is, appropriately enough, shaped like Noah’s famous boat. 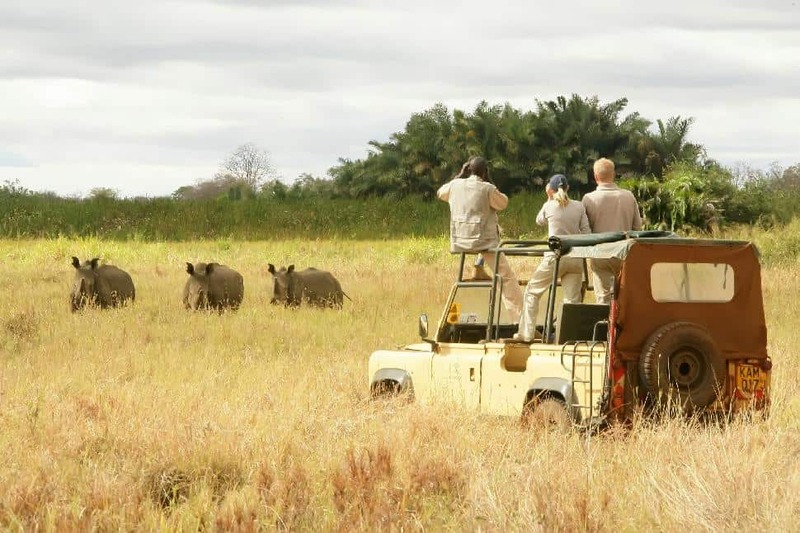 Surrounded by a salt lick and located next to a watering hole, everything from leopard to warthogs to Cape Buffalo and dozens of elephants gather here, and you can view them from the comfort of your room, or from one of four expansive viewing decks. And you needn’t worry about missing a thing, as each guestroom is handily equipped with a buzzer, which alerts you to the arrival of new wildlife outside. Conversely, a stay at Aberdere Country Club feels like a trip back to an age of great refinement – you can almost see 19th-century women with white parasols and men in wool suits strolling around on the lodge’s lovely, cultivated grounds. And many of the old-time luxuries (and quirks) persist to today – peacocks still strut around, showing off their colourful plumage, the cuisine remains impressive (the chef greets every diner, and asks about dietary preferences and limitations) and the service, very personalized. Set on a 1,300-hectare game preserve, it is also surrounded by wildlife, including giraffe, eland, impala and zebra, which you can view close-up on walking safaris, where a guide serves as both interpreter and protector, taking you down small paths and out to the animals. But perhaps the most unique wildlife experience in Kenya is out on the links, on Aberdere’s nine-hole golf course. Aided by my indefatigable caddy Stanley, who was clad in safari green khakis and sturdy rubber boots, I went out on the course. On the first hole, I drove the ball toward a green occupied by a group of zebra, their tails slowing waving in the breeze as they basked in the sun. The approach was similarly busy, with a huge eland down on his haunches, squarely between the sand traps. Fortunately for them, my ball veered off toward the cabbage, and Stanley, always ready to help, trotted off after it. Using two irons, he tamped down the wild flora and, when I arrived to help spot my errant white Top Flite, he pointed out the abundance of a plant called “Sodom apples,” which are apparently girded by a surfeit of poisonous thorns. I now understood the rationale behind the boots. After rescuing the ball, I was able to put in on the green, the animals generously vacating it before my arrival, but then zoomed my putt past the hole (Stanley helpfully observed, “You have hit it with too much effort”). After finishing out a couple more holes, with Stanley serving as a forgiving scorekeeper, I headed back to the lodge to prepare for my departure to other parts of the country. Many more adventures lay ahead – the Masai Mara, Carnivore restaurant in Nairobi (where exotic meats like crocodile and ox testicles are brought to you on a platter), Mount Kenya. So much to do, so little time – just another day in Kenya.